"Men with a backbone of steel are hard to find these days, and even harder to find in the U.S. Senate," former Senator and conservative icon Tom Coburn wrote in a statement endorsing Judge Roy Moore for Senate. "I proudly endorse Judge Moore because we need him to be a conservative voice in the Senate. He is a man who can't be bought, who won't fall in line with the Washington establishment and who will stand up for what he believes in." Senator Coburn is one of the most powerful conservative voices yet to come out for Judge Moore, but he’s hardly the only one. Politico reports that House Freedom Caucus Chairman Mark Meadows endorsed former Alabama Chief Justice Roy Moore for the Senate last Wednesday, delivering another conservative boost to Moore in the hotly contested primary. "I am proud to endorse Judge Roy Moore for the U.S. Senate. The people of Alabama are seeing millions of dollars in false advertising flow into their state," Meadows said in a statement released by the Moore campaign. "From what I know about the people of Alabama, their vote is NOT for sale. They want a strong man — a principled conservative — to send a clear message to Washington, D.C."
Spine, backbone of steel, political outsider, isn’t afraid, a strong man, not for sale… the exact opposite of what passes for a public servant in today’s Washington, DC. These endorsements are helping build momentum for Judge Moore, but it will take more than conservative unity to defeat the millions of special interest dollars that are already flowing into incumbent Senator Strange’s campaign war chest. 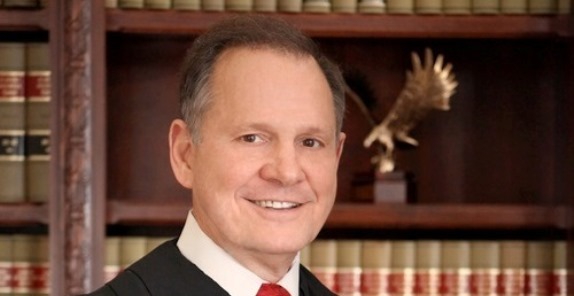 Judge Roy Moore is the real deal. A Bible-believing Christian and a constitutional originalist who lives the values he campaigns on and will not be intimidated or bought by the Washington establishment. We urge all our conservative – populist friends in Alabama to unite behind Roy Moore, and all our readers across the country to support his campaign. Please go to roymoore.org to contribute and learn how you can help. Submitted by email_registrat... on Wed, 09/13/2017 - 18:37. Amen! If the establishment hates him, he's our man! Submitted by sdofaz on Wed, 09/13/2017 - 11:25. Best of all about this man is the establishment hates him. That makes him a great candidate! Go and win Judge!